Can't get enough Spider-Man? 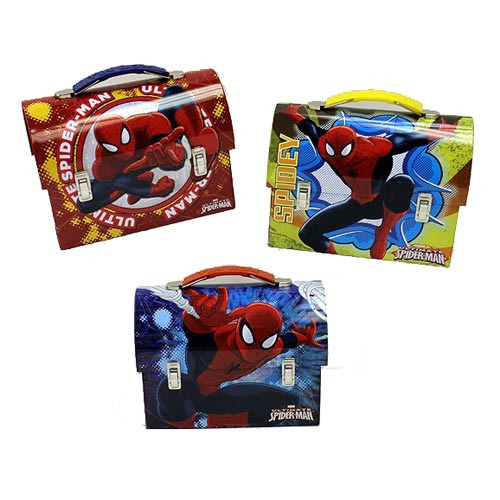 Well, you get 3 sensational Spider-Man-themed lunch boxes - in 3 different colorful designs - in this Spider-Man Large Workman Carry All Tin Tote Lunch Box Set! Spidey is ready to sling his web on the blue-handled tote based on Ultimate Spider-Man, and he's right in your face on the second tote with a red handle. The famed superhero is poised to leap into action on the third lunch box that sports a yellow handle and the word "Spidey." Each workman-styled metal tote measures 7 1/4-inches long x 5 3/8-inches tall x 3 1/2-inches wide. You get them all! Ages 8 and up.